Probably John Hughes' least known teen movie from the 80's. A teen love story, told with some great understated humour, very quotable one-liners, a great soundtrack, excellent performances from the principle cast members, arguably one of the best kissing scenes in any movie, and the perfect audience pleasing ending. The standout performance is that of Mary Stuart Masterson as the drumming tomboy Watts, in one of her best on screen roles. Eric Stoltz is excellent as Keith, who's role, if you believe the trivia, was written with him in mind. A very 80's Lea Thompson does a fine job as the beautiful and popular Amanda, who was given the role after Molly Ringwald, a John Hughes regular at the time, refused it. And Craig Sheffer as Hardy, who has no difficulty in pulling off the antagonistic rich boy. The story itself is not new of course, and it has been argued that this is simply a gender-reversed version of John Hughes' previous success Pretty in Pink. John Hughes failed to convince test audiences with the original ending of Pretty in Pink, and it has been reported that he wanted to rectify this, and improve on the basic story. This is why he wrote and produced Some Kind of Wonderful. The question remains then, if Pretty In Pink was such a success, why has Some Kind of Wonderful remained an unknown and somewhat under-rated movie? Some Kind of Wonderful has a better story, certainly a better ending, stronger lead performances, more natural dialogue, and improved directing. There's probably not one single answer to that question. 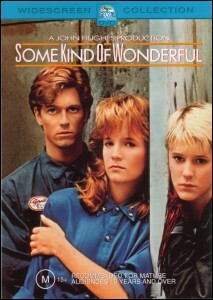 But, if you lived through the 80's ask your friends if they've ever heard of the movie Some Kind of Wonderful, and invariably the answer will be no. Then ask yourself when you first saw this movie. For most of us it wasn't even in a cinema, it was many years later on television or on rental video. Perhaps it was the pulling power of the Ringwald factor with Pretty In Pink, or a lack of marketing for Some Kind of Wonderful, or was it simply bad timing? This was after all, John Hughes' last teen movie. Perhaps if it had been released a few years earlier it may have been a bigger success. Whatever the reasons, and despite its under-rated status, it remains an excellent example of John Hughes' work, possibly one of his best, backed up with excellent performances, and some fine directing. The DVD was released in late 2002 in most regions (R1 USA/Canada - NTSC, R2 Europe - PAL, and R4 Australia/New Zealand - PAL). Unfortunately, like most of Paramount's 80's releases to date, it features no extras. No trailer, no out-takes, no deleted scenes, and no commentary, which is rather disappointing, especially considering this is a John Hughes written and produced film, surely one of the high profile writer/director/producer's of the 80's. Possibly the biggest issue with the DVD, is the quality of the transfer from the original film master. During some scenes it is excessively grainy, and the colours appear very washed-out. So much so, that at times, Watts' gloves are brown, not red. If Paramount ever release a Special Edition DVD at some point, we can only hope they do a re-mastering. Nevertheless, it is good to finally have this film available on DVD in 16:9 wide screen format, allowing fans to replace their no doubt worn out VHS copies, or the inferior TV version they taped years ago.